ean Baptiste de Lamarck wrote two major treatises on evolution, Zoologie Philosophique (1809) and Histoire Naturelle des Animaux Sans Vertebres (1815), but he had started to express his ideas on evolution in lectures to his students in 1800. In these books Lamarck argued for two aspects of evolution: the reality of evolution and the history of evolution. (1) That all the organised bodies of our earth are true productions of nature, wrought successively throughout long periods of time. (2) That in her procedure, nature begins and still begins by fashioning the simplest of organised bodies, and that it is these alone which she fashions immediately, that is to say, only the rudiments of organisation indicated in the term spontaneous generation. (3) That, since the rudiments of the animal and plant were fashioned in suitable places and conditions, the properties of a commencing life and established organic movement necessarily caused a gradual development of the organs, and of course of time produced diversity in them as in the limbs. (4) That the property of growth is inherent in every part of the organised body, from the earliest manifestations of life; and then gave rise to different kinds of multiplication and reproduction, so that the increase of complexity of organisation, and of the shape and variety of the parts, has been preserved. (5) That with the help of time, of conditions that necessarily were favourable, of the changes successively undergone by every part of the earth's surface, and, finally, of the power of new conditions and habits to modify the organs of living bodies, all those which now exist have imperceptibly been fashioned such as we see them. Many historians of science have claimed that Lamarck believed in Aristotle’s Scale of Nature, and they base this mistaken belief on his use of the phrase "a true scale in each of these kingdoms." He emphatically refuted this notion in 1815 when he pointed out that "it has been supposed that I intended to talk about the existence of an uninterrupted chain, formed by all the living beings, from the simplest to the most complex, uniting the former with the latter……. what I have to demonstrate has nothing to do with such a chain, for it does not exist" (Histoire Naturelle des Animaux Sans Vertebres 110-11). Some of his critics have suggested, and others continue to claim, that his model represents a form of escalator of life, whereby the simplest organisms were spontaneously generated after which theye immediately started to evolve into more complex entities, leaving space for further spontaneous generation. Because Lamarck did not believe in extinction, the logical outcome of these processes would be an increasing number of highly complex taxa and a severely overcrowded planet. In fact, Lamarck stated that increasing complexity only affects the higher groups of organisms whereas the lower groups are isolated on the sides of his "graduated scale". Once an organism has become part of a lower taxonomic group its path to higher taxa is forever blocked: there was no escalator. He understood that organisms diverged along different evolutionary pathways, and therefore animals could not be classified in a single line: "I do not mean that existing animals form a very simple series, regularly graded throughout; but I do mean that they form a branching series, irregularly graded and free from discontinuity, or at least once free from it" (Zoologie Philosophique 46). 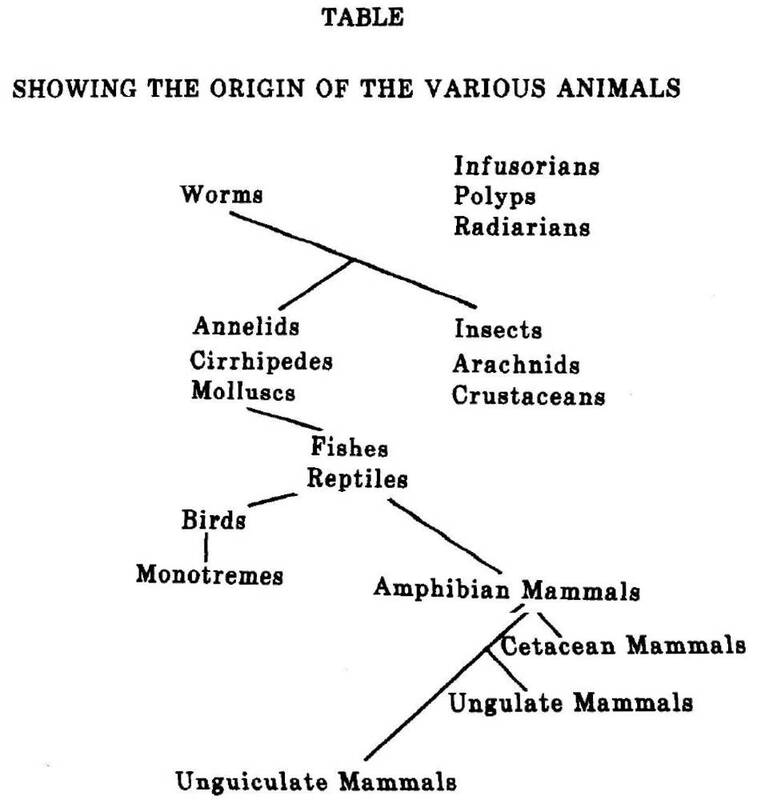 He was the first to publish a diagram to show the correlation between classification and evolution in different animal groups in the form of an evolutionary tree. This was the first time that zoological facts had been presented in this way, but unlike Charles Darwin's purely hypothetical trees, Lamarck's could be tested against the evidence. He chose a descending rather than ascending scheme because he was following the convention of his time, and this is probably why its significance and originality have been frequently overlooked. He told his students in 1802 that: "I ought to begin with the presentation of the characters of the most simply organised animals, and thereafter ascend gradually to those most perfect animals, thus following the order that nature seems to have kept in forming them" (Discours douverture, 51). When Lamarck started his studies he believed that animals and plants had degenerated from the more to the less complex — a view widely held at the time — but he came to the opposite conclusion and had to work hard to convince others that he was right.